Back in July, I found a new interactive park locator on the Hendricks County Parks & Recreation website, and since then, I&apos;ve been taking my kids all over Hendricks County, trying out parks that we didn&apos;t know existed until recently. 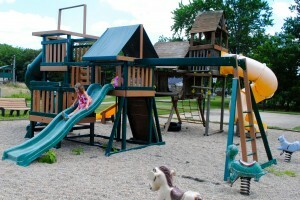 Last time, we checked out Lambert Park in Clayton, Indiana. This time, we ventured up to North Salem Community Park. Getting There Getting to North Salem -- home of Old Fashion Days -- is easy. From I-74, take the Ind. 75 exit and follow 75 south through Jamestown to North Salem. From the south, you can take either Ind. 75 or Ind. 236 into town. The two state highways converge in North Salem. Once you&apos;re in North Salem, however, finding North Salem Community Park is a little tricky. For those with GPS, the park&apos;s address is 103 N. Main St. in North Salem, but that will only get you close. Fortunately, though, you can enter the park from two different locations. If you&apos;re coming into town on Ind. 236, you&apos;ll pass Fairview Cemetery on your right, then cross a bridge over a creek. Immediately after that bridge, start looking for Eel River Village Apartments on your right. Turn into the apartment complex, and you&apos;ll immediately see a gravel road veering to the left. Take that gravel road. You&apos;ll see a big white sign for Machinery Field. 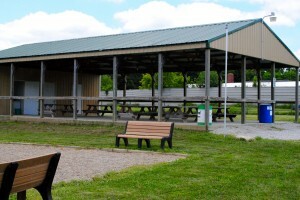 The park is across from Machinery Field on your left. You can also access the park from Ind. 75 (Main Street), just north of Ind. 236. Immediately after you turn right (north) onto 75 from 236, you&apos;ll see a road marker sign and a pedestrian crossing sign. In between those two signs is a gravel road. It looks like someone&apos;s driveway, but it will lead you to the park on your right. Park Amenities North Salem Community Park is a 3-acre facility owned by the Town of North Salem. Since it&apos;s so tucked away, there is no traffic whatsoever around the park, allowing you to let your kids run free without concern. Bring a basketball because there is a nice half-court there with basketball goals at both ends. 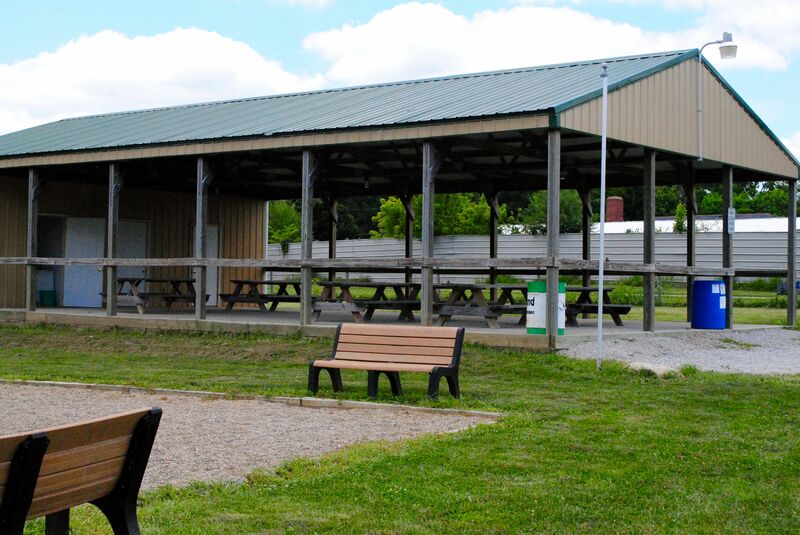 There is playground equipment, swings, a grill and a nice-sized 30&apos;x58&apos; shelter that houses several picnic tables and some modern bathrooms. 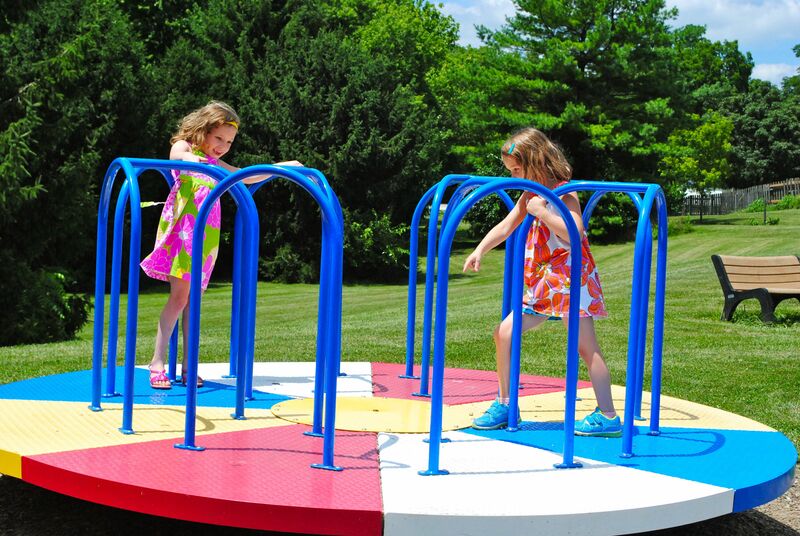 The playground equipment consists of a wooden playset that features four slides, all of which are made of plastic and two of which are enclosed. We were there on a nice sunny day, and neither of my kids complained of the slides being too hot. There&apos;s a merry-go-round that my girls LOVED, and it either has brand-new handlebars, or they were just freshly painted because they were smooth as silk for my girls to hang on to while I spun them. They had a blast, and I made myself sick running around and around in circles. The swingset includes a couple of toddler swings, and the playset has a little tire swing that toddlers will enjoy. They have some of those riding animals on springs that younger kids love, and the surface of the play area is covered with pea gravel, so wipeouts don&apos;t cause serious injury. There were several benches for me to sit on while the girls played, and when I got warm in the sun, I simply moved a few feet back to the shelter and was still able to watch my kids just fine. What the Critics Say My daughters, ages 7 and 6, loved North Salem Community Park. As soon as we pulled up, they spotted the merry-go-round and immediately made a bee-line for it. 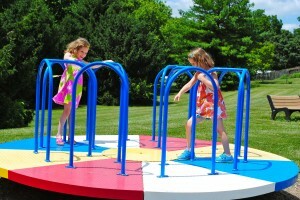 When I asked them about their favorite part of the park, the merry-go-round was the instant answer from both girls. They also spent a lot of time in the green enclosed slide, going down backwards, on their stomachs, sideways, and any other silly way they could think of. The restrooms passed the muster of my youngest, and when I asked them if they&apos;d like to return to North Salem Community Park, the vote was unanimous and resoundingly affirmative. So now I have Lambert Park in Clayton and North Salem Community Park added to my list of parks my family enjoys. I wonder what we&apos;ll discover next.